Swing is the symbol and carefree childhood. Remember the popular song about the winged swing, it is more of lightness and joy. 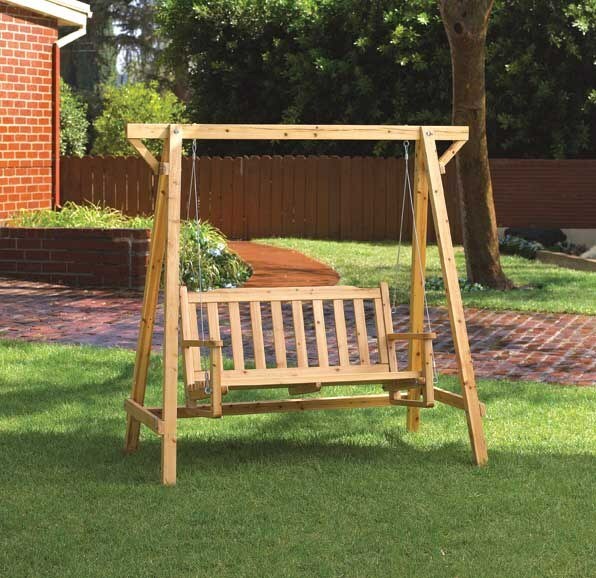 And imagine how much fun will bring the swing seat for the garden made by your own hands! In the manufacture of garden swing you need to properly for them to install the bearing support. Of course, a pillar of iron will be safer and stronger than from bars and logs. However, it can be done only with the help of welding machine. For those who do not have this capability, you can opt for sturdy wooden pillars, able to withstand the weight of 120 to 150 kg. - clamps-clamps for wire rope. Wire may be metallic, made of synthetic material or in the form of chains with large links. The circuit is not susceptible to weathering, more secure, very decorative. Manufacturer of garden swings start with a backbone. Assemble lower frame to which will be attached to the vertical bars. As for the size of the boards for the frame, it depends on the size of the desired seat of the swing. The best option is the seat depth of 50-60 cm and a length of about 160-180 cm Frame should be wider than the seat of the swing is about 40-50 cm for their sustainability. Bars securely fasten metal corners. If the swing will not be located in tile/asphalt/concrete pavement and on the ground, to exclude or delay the process of rotting the wood beams of the lower frame to be treated with bitumen. In addition, all wooden parts for garden swings should be treated with antiseptics. When the frame is ready, to it using screws and angles are vertical bars, which will perform the function of the pillars. In result you have 2 large triangles. To the top you want to attach the horizontal crossbar. Now you can start making benches. We must act in the same sequence, starting with the framework of bars. Framework should have two pieces — one for seat and one for the back. After that, the framework or screw the plywood or nail strips. Connect the back corners of the seat. The angle between the seat and back should be about 120° to reach travelers more comfort. Next, you can fasten the armrests - 2 bar, connected at a 90° angle. However, this is not necessary since it is possible to manage and without armrests. Secure clamps or the hooks on the top rail, pass through the holes of the chain or rope. Measure its length so that when sitting on the swing was socks to get to the ground. After that, attach the seat. At the main part of manufacturing of garden swing is made. However, you can not to stop and, for example, to complement a ready-made swing awning. On a frame of bars pull any fabric and secure the awning to the top of the swing. The following caveat is the stiffness of the bench-seat. You can put on the seat 2 or the sofa is made specifically for swing cushion. For durability to cushions, it is desirable to make a cover of oilcloth or polyethylene. Garden swing can be placed in the garden, on the lawn at the cottage, in the shade of the branches near the house in the village. You can also make your hands baby rope swing. It is better to place on the branch of a large tree. If you have a young garden and this tree is not exists on the site, you can make a support frame or to use a branch of timber. In the second version should take a log with length of 3 m and a diameter of 12.5 cm and bind him with ropes to a tree, resting between two strong branches. The flight logs should have a length of about 1 m And to arrange a "branch" should be on a height of 2.6 m above the ground. We should not forget that the main thing in design is its safety, especially if you produce a swing for children. After completion do not forget to check the finished product for durability. To make rope "swing", you'll need ceselski rope with a diameter of 1.3 cm the Ends of the cable tie with string, to fiber bloom. Rope tie to a branch or beam, so that the loop and node 3. The distance between the ropes should be between 50 cm using the same loops and knots the rope is then attached to the seat. For rope swing seat it is possible to make 2 small logs with a length of 70 cm, diameter about 8.5 cm and a spacing between ropes of 50 cm Rope get between the logs and wrap around each of them, tying 3 knots. On the background of the garden is such a garden swing is attractive and organic, but they're not always convenient. However, you can make them soft cases. Seat can take a flexible and secure it to the rifle. Subsequently, this seat can be removed to replace it with another.